I support small local coffee houses, nothing beats them, but I must admit that there is something about Starbucks that is just so damn inviting! The music, the couches, the cool people... now I want a Frapaccino. Regarding #7, my fave place for ice cream was Dairy Queen, but they didn't have one in my town. We'd go to DQ when we visited my grandparents in Chatham on Cape Cod. LOL I was never allowed Taco Bell, we went to ChiChi's! @Kerri-we don't really have that many near us and the one in our town closes at 5?? @Joe-There's a DQ somewhere around here, but I think I've only been there once as a kid on vacation. Ha ha! @Lisa Marie ChiChis! I think I remember this place - it was a chain! I totally forgot about it. Those little aliens sound familiar and I do remember when they had "limited time only" Asian nugz! "hitting a handful of open houses (as in viewing houses for sale)"
As opposed to say, smacking them upside the roof or robbing them? I remember when those tacos could be purchased for a few dimes. Curse you inflation! You wanna see bad, the Dunkin' Donuts in TN has about a third the usual selection. They don't even have peanut donuts. Criminal. Here's an old Jersey chain restaurant that was big: Ground Round! I had my 5th birthday party at the one in Belleville. I haven't thought about it in years. I also remember Howard Johnson's...28 flavors of ice cream and the greasiest hot dogs I've ever eaten, but my mother insisted they had the cleanest rest rooms and when we drove to Florida that's where we always stopped. And I remember Taylor Ham or Taylor Pork Roll which is difficult to find in Texas. Best egg sandwiches are made with the stuff. I remember all of these things!! Makes me feel a bit old and cramped, but hey, at least I only had a few choices in my youth, where now it feels like there is too much sometimes! Remember Bob's Big Boy? One of my veyr first blog posts, nearly 1,000 posts ago, was a memoir of taco bell, which i now refer to as taco hell, as i've gone benedict arnold on the joint and now opp for the bueno. 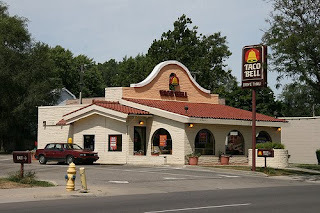 I know I'm dating myself here, but does anybody remember "bell beefers" at taco bell? It was a taco (w/onions)on a hamburger bun. Best thing they ever offered. Like your blogs and think I'll tag along for a while. 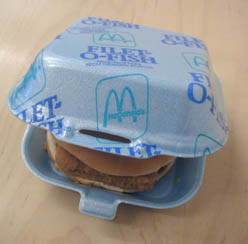 I remember Taco Bell for their Chilitos and White Castle for their sliders both at 2 am after a night of partying. I can't eat at either place anymore. Do you remember Burger Chef? I don't know if they were national or not, they were a chain though that I went to in St. Louis when I was a kid. In the seventies, when I became a vegetarian hippy (there weren't many vegetarians in the midwest so I was thought of as an alien, I also had my nose pierced, so yeah, I was an alien) Anyhoo.... when I became a vegetarian I used to go to Burger Chef and order a cheeseburger and then tell them to hold the burger so I would get cheese on a bun. Why you ask? Well, at Burger Chef they had a burger bar, where you could take your burger and add all the fixings, as much as you wanted, to your burger: lettuce, tomato, onion, pickles, relish. I would make myself an awesome cheese sandwich for fifteen cents, which is what they charged you for cheese on a bun. They really loved me in St. Louis, which is why I moved to Las Vegas. @Aine - I don't recall Burger Chef - it sounds west coast or something. Roy Rogers had an awesome Fixins bar. When I was a little kid, like five, I loved Arby's. There are some Arby's around - there's one in our shopping mall. Remember Choco Tacos at Taco Bell?! I miss those. In Detroit, where I grew up, I don't actually remember having a Taco Bell or a Del Taco. The only tacos you could get were from Kroger or Farmer Jack - Old El Paso make 'em at home and grate your own cheddar cheese! Please do a Remember When about breakfast cereal! Remember Halfsies?! or Boo Berry?! Those were the days. @Rebekah - I think I have written about old cereals. I'll search for you! If not, I promise to! burger king's king wasn't a scary plastic head, but a scary guy in a king outfit? I loved ground round! with the movies/cartoons in the kids area, and the endless popcorn...and when MTV only played music videos?? Mom and I like Starbucks too. When we were kids we loved going to Carvels or Magic Fountain for ice cream. We'd go to Friendly's sometimes but didn't like it as much as these 2 places. We were sad when Magic Fountain closed down.